I previously wrote about the AFM Racing’s Super Dino class of racing, wherein only motorcycles of a particular age are eligible to compete in, but otherwise the regulations for the types of bikes and modifications are pretty open. It’s my favorite class of racing in the AFM partly because of my historical love for older bikes, and mostly because by definition, I own a super dino. While my ’02 R1’s engine has remained untouched, virtually everything else on the bike has been improved or modified. I do believe I can count in just one hand what remains original in the bike from the manufacturer. That’s how much I’ve super’d up this twelve-year old dino bike of mine. And while I’ll admit that building up my R1 to become far better than how it started began simply as a hobby of mine, it eventually escalated into a personal mission to turn the bike from a rolling showpiece, to a genuinely fantastically performing motorcycle. 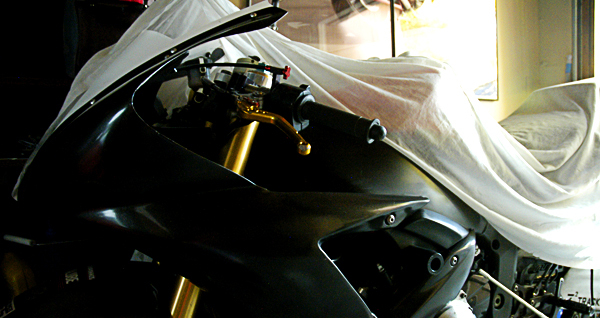 I wanted to build the baddest ’02 R1 this side of the country. 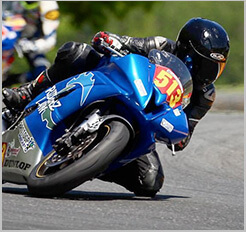 I wanted to turn my bike to a superbike, much like those I see in the motorcycle road racing series’ that I follow. And much like the road racers that I would watch on these superbikes, I wanted to follow suit. I wanted to give road racing a try on my built superbike, and the AFM’s Super Dino racing class proved to be the category to try it in. Only, I’ve had to wait, because since learning of the Super Dino category and its rule that motorcycles must be over 13 years or older to be eligible to compete, it meant that my ’02 R1 wouldn’t be eligible until 2015. But I didn’t mind waiting, because in the meantime, I could keep building up the bike, and I could keep honing my riding ability to have a much better chance at being remotely competitive when I finally do my first race. When I sold my 2007 Yamaha R1 earlier this year, part of the reason was to spend the rest of this riding season getting acclimated on my ’02 R1 again, in preparation for racing Super Dino next year. And as we enter the final quarter of 2014, my excitement has been building to finally give road racing on my bike a shot next year. Only, it just may not be in the class I’ve been wanting after all. Not in Super Dino. Not on this bike. I may have to keep it covered from racing a little longer. I actually read that from the 2013 rulebook about a year ago, but silly me only thought that “of course it’s 2000 or older, as that’s 13 years ago.” So naturally, I deduced that in the 2015 AFM rulebook, it would then read “bikes must be model year 2002 or older and like.” But I was wrong, as the AFM has adopted the 2000 model year for a motorcycle to be eligible for the Super Dino class, completely ruling out my ’02 R1 from eligibility. Of course that doesn’t really have to stop me from trying road racing, or racing my ’02 R1; there are a few other classes that my bike would be eligible for. Thing is, though I can race it, it would have to be in a class made up of riders in later-model bikes, and considering how much motorcycle technology advanced within the last decade, even my super’d dino bike can still be at a disadvantage. Not quite like bringing-a-knife-to-a-gunfight disadvantage, probably more like bringing-a-handgun-to-a-rifle- fest handicap. So if I’m to stick with my handgun, I better work harder at making my shots count.